Mario games may be bright, colorful and easy for children to get into, but don't you dare call them "childish" to Shigeru Miyamoto's face. The "Iwata Asks" column from several weeks ago - in which Shigeru Miyamoto admitted that Super Mario Galaxy 2 started as SMG 1.5 - is now finally available in English, and with it yet another look into the mind of Nintendo mastermind Shigeru Miyamoto. Among the many, many topics discussed by Miyamoto and Nintendo boss Satoru Iwata is the difference between making a game that is played by children, and making a game that is childish. Unless you're careful, there's a tendency for games like Mario that can be played by children to gradually become childish. Those making the game tend to unconsciously make them that way. Taking how Mario's line can be scripted as an example, they even propose to write, "Where'd my mommy go?". When someone in their fifties like me hears their player-character speak childishly like that, it doesn't quite sit right. After all, Mario wasn't a game only for children in the first place. It's true that Miyamoto and Nintendo make games designed for children to be able to play them. In fact, earlier in the interview, Miyamoto discusses how he directed artists to design enemies such that their purpose was immediately obvious "just by looking at them" - but that doesn't mean they make children's games. 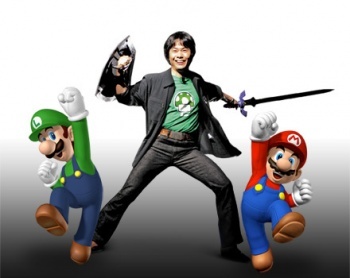 After all, says Miyamoto, "[as] I make a game, I try to keep in mind that guys in their fifties will play it, too."